Poster designed and illustrated for craft beer hub in Auckland—Brothers Beer. The Brothers Beer annual Summer Session Challenge calls for some of the best NZ craft breweries to each brew a sessionable beer suitable for a long, hot afternoon. As Brothers Beer is renowned for their diverse 18-tap line-up of craft beers, I devised that the Summer Session Challenge would be a beer-lover’s oasis on a hot summer’s day. 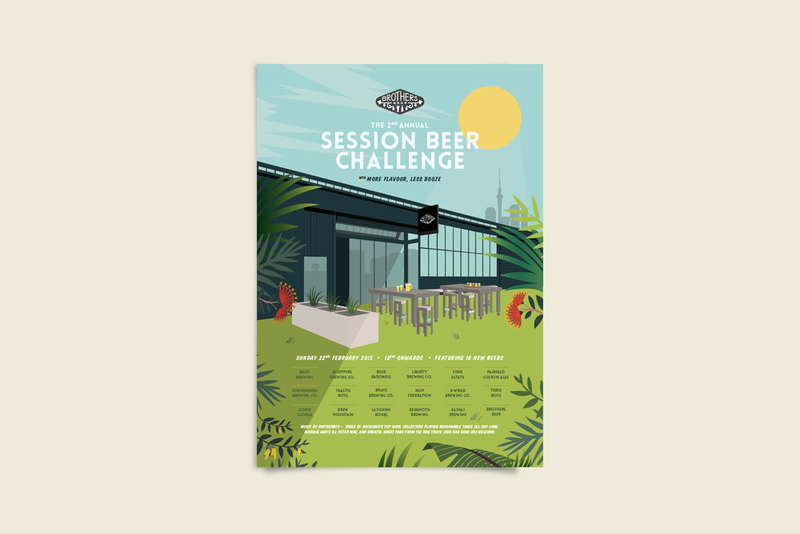 Featuring eighteen new beers, a BBQ, food trucks, DJs, roll-out astro turf and even a bowl for the dog, the annual Brothers Beer Summer Session Challenge captures the true NZ craft beer spirit.